On our mommy & Watts days, he often suggests activities. His typical request being, “Wanna play Legos wit me?”. But this last Tuesday he asked, “Can we go for a walk?” Before I could say ‘yes’, he upped his offer, “Can we go for a run?” And this exercise-deprived momma answered, “most definitely”. We took off and almost instantly his smile appeared. Then he reached out with his sweet left hand and grabbed mine. And we ran . . .for about 200 feet before the 90 degree forced us to stop and turn around. But choosing to say “yes” and drive to the park was 100% worth it, for the memory of running while holding his hand. Because the next day I held that exact hand again. . . . this time to keep his arm still while he screamed and the x-ray machine took an image of his broken bones. You see Wednesday of this week we decided to go to a park before church. I had just finished listening to Quade read for school. He jumped up to join his brothers. I stayed on the bench, watching from afar, thinking about an earlier conversation with a friend. When I saw Knox wander over to a nearby soccer practice (and knowing his love for balls of any size, shape or color), I knew an intervention would be in order. So stood up and walked towards him. That’s when I heard the fall next to the slide and Watts’ screams. I turned to see him lying on the wood chips, crying out and his left arm limp. (Moms, this is where you remind your kids a phrase I’ve said a thousand times, “Go up the stairs, down the slide.” And also, “Obedience can bring blessing. Disobedience can bring pain.” Okay, back to the story). By God’s grace, right before going to the park we had stopped at Walgreens to buy some chewable Ibuprofen for Quade’s headaches. The first thing I did after comforting Watts, was give him some pain medicine. (Knox’s first thing was to kiss his brother on the head). And by God’s grace, a mom standing nearby was kind enough to give us an ice pack. I called Bruce immediately and, by God’s grace, Bruce was already in his car about to go to a work dinner. The next step was to get all the boys in the car. So I scooped Watts into my arms while Quade & Price attempted to convince Knox to leave the playground (a challenging task). Once everyone was settled in the car I took a deep breath and stuck the key in the ignition, turning it over to hear a “click” and no engine response, only a flashing battery sign on my dash. The big boys and I started saying prayers out loud, asking for God to make a way out and to fix the broken car. Yes, yes He was. He was already teaching me. Bad things happen and sometimes bad things happen all at once. But it’s amazing how God gave me eyes to see His grace right in the midst of the hard and walk in it. Feeling like I was surrounded by His giant grace bubble walking through these challenges. By God’s grace I thought to call a couple of friends who were on their way to church. My dear friend Kris picked up the two big boys & joined with me in the shock of how was all this possible and promised to pray (I’m just remembering now, she is my ‘bump into grace’ friend). Within a few seconds another dear friend, Amber, pulled up and offered to take Knox, but we realized it be best for him to just stay with Bruce and go to bed early. She told me she had already been praying. Bruce arrived and we swapped places. I drove off with Watts. And Bruce and Knox stayed with the Suburban waiting on AAA (and Knox got more time at the park. . .grace for him). By God’s grace, a new independent ER just opened up a month ago a few minutes from where we were. After grabbing a fruit punch juice box from their stocked mini-fridge, we walked right in to an examine room. I laid Watts down on the bed and he started shaking, his bottom lip popped out and the tears started coming. By God’s grace the nurse who was in there brought him back a heated blanket. Dr. Bob informed Watts right away that we were in the “no shots room” (whew). By God’s grace the x-rays showed fractures across his radius and ulna, just below the wrist, with no surgery required. With Watts’ additional pain medicine kicking in and help from the T.V. show, “Sheriff Callie” (a cat cowboy? really? 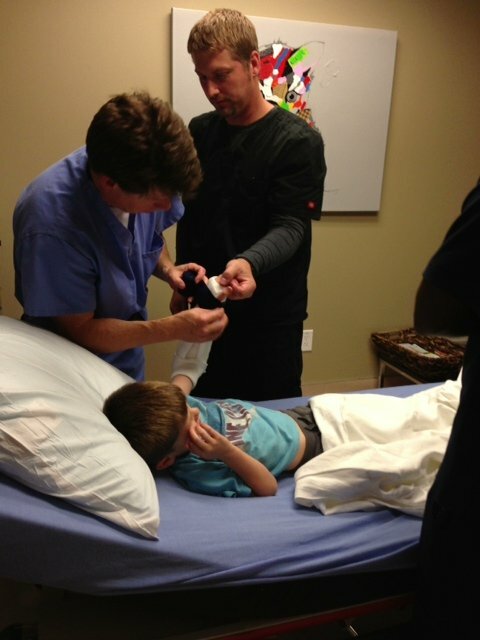 ), the doc placed a fiberglass splint around Watts’ arm and not one tear shed. 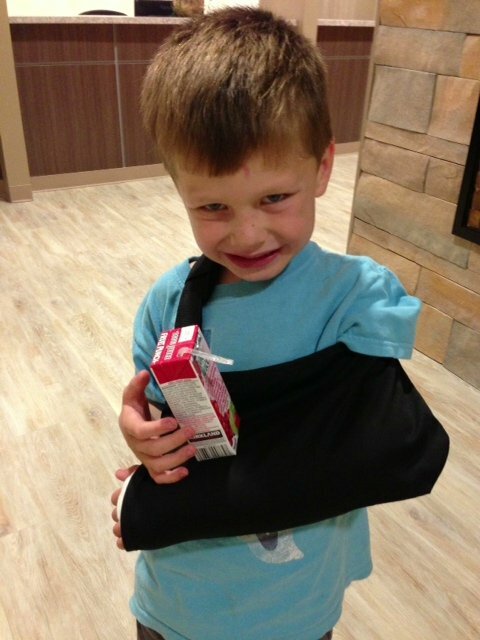 With the sling in place, as we walked out Watts informed me his broken arm made a good table for his juice box. Grace. Things will break in life. People will break into your home. Vases break. Bones break. We often see broken as bad, reminding ourselves how we live in a “broken world”. 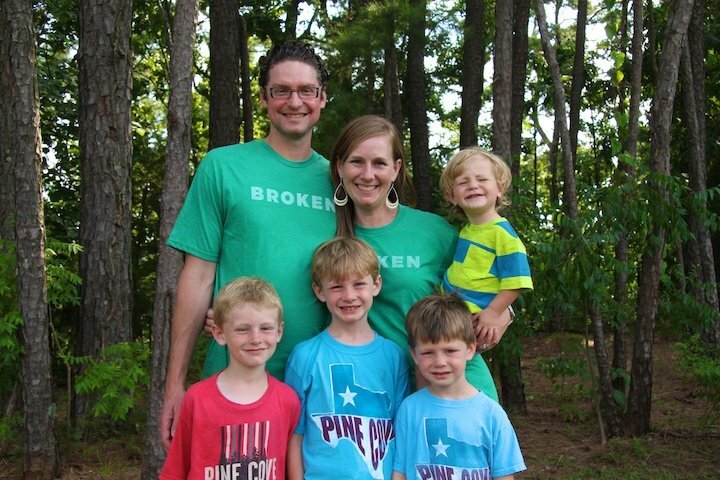 But the first “boy broken bone” is reminding me broken can be for good. In the parable of the sower there are 4 types of soil. Good fruit cannot grow in hard, packed down dirt (aka, “fallow ground”). The verse above reminds us, in order for God to work in our hearts and grow good fruit, sometimes we need brokenness. A stirring up of the soil. For love, joy, peace, patience, kindness, goodness and gentleness to grow. What ever hard things you walk through today, this weekend, next month, this year, find His grace and walk in it. In your giant grace bubble. What grace have you found in broken places? Favorite part – when Price asks “Is He trying to teach us something?” Such a valuable principle for him to be aware of – the fact that God can and will use everything we encounter to shape our character and display His glory. It took me several decades to get that. I am conditioning myself to ask Him what He is doing in every circumstance, pleasant or unpleasant. After all, Jesus did nothing unless He saw the Father do it. In our process of becoming Christ-like, it is imperative that we follow that example. The fact that Price is aware is a powerful and positive reflection on your example. LOVE that!! oh yes! thank you for giving me eyes to see the blessing of his spiritual perspective. In the midst of the chaos, I kinda zoomed right past that nugget of goodness. Love this story. Tears here, knowing that He does bring us broken places for our good. It is in the deep places that we see God as our only hope, and I am so thankful for those places. thank you dear friend. Thank you for being a voxer-away with prayer and support. And “amen” to your statement, “it is the deep places that we see God as our only hope”. I so admire you for being able to see the grace in the midst of the broken places. What a gift to your boys. Love you! Behind on reading my BlogLovin feed, so just reading this today! I love this “in order for God to work in our hearts and grow good fruit, sometimes we need brokenness. A stirring up of the soil. For love, joy, peace, patience, kindness, goodness and gentleness to grow.” Just dealing with some “hard” the past couple of weeks and the broken reality, which is actually usually comforting, has been tough. Love how God used this post to speak to my heart tonight! Thanks!